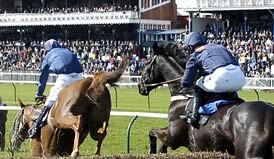 Racing at Ayr today has been abandoned on health and safety grounds because there was no working PA system at the track. The Race Tech truck supplying sound and vision had to be moved after a tree became unsafe in the high winds. Without a working PA racing could not go ahead. Earlier the track had passed an inspection and winds gusting up to 80 mph were forecast to abate around lunchtime.